The Barcelona Institute of Science and Technology (BIST) is a multidisciplinary research institute formed by the alliance of six top research centers in Barcelona. The BIST community is formed by the following centers: the Centre for Genomic Regulation (CRG); the Institute of Photonic Sciences (ICFO); the Institute of Chemical Research of Catalonia (ICIQ); the Catalan Institute for Nanoscience and Nanotechnology (ICN2); the High Energy Physics Institute (IFAE); and the Institute for Research in Biomedicine (IRB Barcelona). 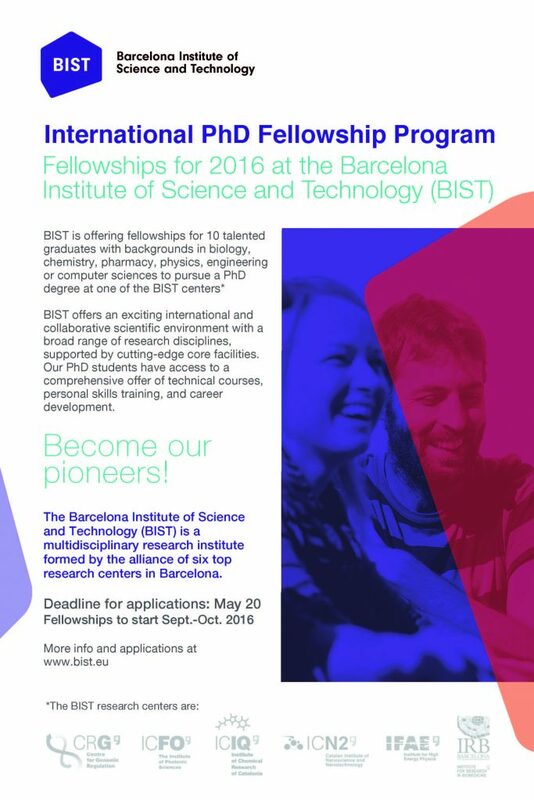 Applications for the 2016 BIST International PhD Program are now open. The application deadline is on Friday, 20 May 2016. We are looking for talented graduates with backgrounds in biology, chemistry, pharmacy, physics, engineering, or computer sciences who are motivated to pursue a PhD at one of the BIST centers. BIST offers an exciting international and collaborative scientific environment that includes a broad range of research disciplines and core facilities. In addition, it offers extensive scientific and technical courses, personal skills training opportunities, and career development advice. Applications will be evaluated on the basis of academic records, research expertise, command of english and scientific motivation. Completion of studies that lead to an official Spanish (or from another country of the European Higher Education Area) university degree in Science or Engineering totaling 300 credits (ECTS), of which at least 60 must correspond to Master’s level or equivalent. The BIST International PhD Fellowship Program has been designed to foster scientific career development. All applications will be reviewed and evaluated by a Selection Committee formed by scientists from the BIST centers. A shortlist of selected candidates will be invited for interviews. Offers of admission will be made to the successful candidates after the interview period. Applicants who have not been successful but have received a positive evaluation will be kept on a BIST database to be considered for future fellowship opportunities. The names and contact details from two university leactures or scientists with whom the applicant has worked. The system will automatically request a recommendation letter from them. BIST is an equal opportunity employer and does not discriminate based on nationality, gender or disability.